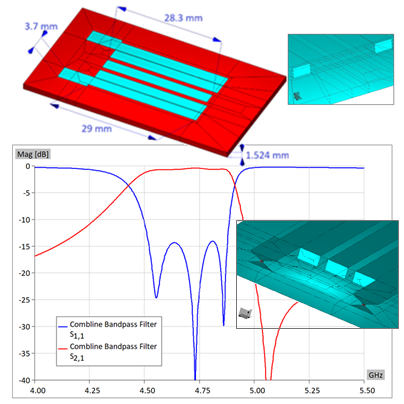 A successful simulation of microstrip combline bandpass filter is demonstrated in this application note. The software tool used for the simulation is WIPL-D Pro software, a full wave 3D EM Method-of-Moments (MoM) based solver. Simulation of one of the classical printed structure, the microstrip combline bandpass filter, was performed in a reasonable time on cost-effective, moderate computer platform. The fabrication of the microstrip filter prototype can follow immediately after the optimization. The optimal dimensions of the filter resonators, input and output lines and the gaps between the lines are all realizable in any standard microstrip technology. In addition, dielectric parameters have been chosen targeting a popular, commercial substrate. The combline filter was simulated between 4.0 GHz and 5.5 GHz. The efficient Fitter, which is part of the WIPL-Graph window, enabled the wideband response of this microstrip filter to be accurately interpolated from model simulation at 37 discrete frequency points. Described bandpass filter is very simple, but it still has very good properties as calculated S-parameters confirm the existence of a transmission zero above the passband which can be used to increase the selectivity at high passband edge. According to all of the analysis details presented, it can be concluded that WIPL-D software is very suitable for the simulation of various microstrip filter structures for both, commercial and academic purposes. In addition, the practical and educative value of this document should be recognized. This document with published dimensions of the structure can be used as a starting point for microstrip combline bandpass filter design and further research.